Have you ever asked yourself if you should worry about termites? Well, yes! You should totally worry about termites. These little bugs can cause billions of dollars in damage per year, more than fires. You should check with your insurance if they cover the damage to your structure by termites, because sometimes they don’t and that is exactly why we recommend to hire a professional pest control service for your house. 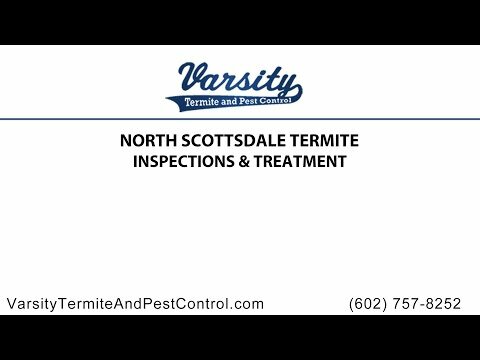 If you are located in Arizona, Varsity Termite and Pest Control is your perfect choice for termite control in North Scottsdale; if you believe your house has a hidden pest full of them, don’t hesitate to give us a call to request our termite inspection where we thoroughly examine each corner of your house to let you know if you house is habituated by termites. HOW CAN I FIND OUT IF MY HOME IS INFESTED BY TERMITES? Flying termites do exist but they usually just appear in your home if there is a colony nearby, and that means inside your house! So if you ever find one of these little flying insects you can contact us to come over to check what kind of termite control you need. Termites like to live underground in dark environments. Considering this behavior, if you find any tunnels under or over your foundations walls, support piers, floor joists or anywhere else in your house, it may be already infested. Remember that the entrance of the tunnels is the size of a pencil’s diameter. They live off the cellulose of the wood so they will go after everything that is made from this material and give it a good bite. Whenever you find wood that is damaged, has blistering surfaces or is now so very thin that it is bendable and breakable, you might already have a termite pest. We recommend you to reach us for a termite inspection in North Scottsdale and see if here is indeed an active infestation. If you want to eliminate them yourself, there are common household items and garden plants that possess insecticidal properties which we don’t guarantee will do the required job. Varsity Termite and Pest Control has an effective Scottsdale pest control treatment that finds a way straight to their colony and also some products that termite workers share with the rest of their nest, including the queen, making them sure to not bother you ever again. HOW DO YOU APPROACH TERMITE CONTROL? Mainly, there are two most chosen options for termite control in Scottsdale, being the first some liquid pesticides that are called termiticides, and the second option termite baits. These are the most effective solution against termite pests but they require the knowledge and professional skills to apply each option in the most efficient way. Expanding on the first option, applying a layer of termiticide on the ground next to a structure infested with termites can repel or even kill the ones that live there. This method sounds simple but, as mentioned before, it requires specific hardware skills that requires good experience before doing an attempt at eliminating termites. Sometimes, termites are located deep under concrete soil, so we have to use concrete drills and injection rods just to reach the core of their nest from where they are entering your home. The second option that we mentioned, the termites baiting system, works by strategically placing poisonous bait along potential termite routs in a structure. Termites will find the bait delicious, so after they come devour it, they will come back to their colony and help spread the poison into every corner of it. Professional expertise is recommended due the demand of constant monitoring and movement of bait stations. Whenever you find yourself in Arizona, and you suspect to need some kind of termite control, Varsity Termite and Pest Control has more than 20 years of experience dealing with all kind of pests and infestations with professional working values and unmatched customer service. Our business has been built on referrals from our satisfied customers that knows we provide the most honest and reliable pest control service. We have expertise in dealing with a huge amount of pests specializing in ants, termites, scorpions, spiders, cockroaches and even mice. Just give us a call asking for more information about our services.